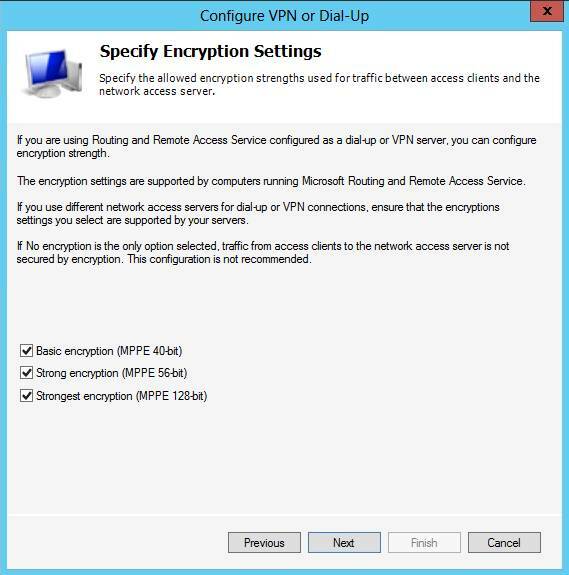 In Part 1 of this series, we took a look at how the Network Policy and Access Services in Windows 2012, and particularly Network Access Protection (NAP) can help to protect your network when VPN clients connect to it by validating health requirements that you institute as part of a health enforcement plan. In Part 2, we shared some tips on actually deploying NAP on Windows Server 2012. In Part 3, we’re going to discuss the process of setting up RADIUS servers. 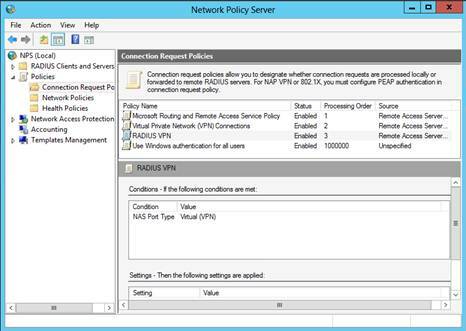 In Windows Server 2012, the Network Policy Service (NPS) can do more than just Network Access Protection (NAP). It can also function as a RADIUS server or a RADIUS proxy, as we mentioned in Part 1 of this series. RADIUS has been around since the early 1990s and is an IETF standard. It was defined in by RFCs 2058 and 2059, which have since been made obsolete by new standards. A good starting point when you’re planning to deploy RADIUS in your organization is RFC 6158, Radius Design Guidelines, published in March 2011. RADIUS is an open source client/server protocol designed to give network administrators the capability of managing authentication, authorization and account (AAA) from a centralized location. These three functions work together to provide control over remote users and computers by first authenticating their identities to determine whether they are allowed to access the network, then authorizing them to use specific network services or connect to specific network resources and proving an accounting so you can track the use of the services. RADIUS servers verify identity through a database on the RADIUS server, the Active Directory database, an LDAP server, Kerberos, a SQL database or other means. Because RADIUS keeps accounting records, it makes it possible to collect statistical information about usage or even to bill users, departments or organizations according to their usage. Remote user/computer sends a request to the remote access server to access specific network resources contained on a network access server. 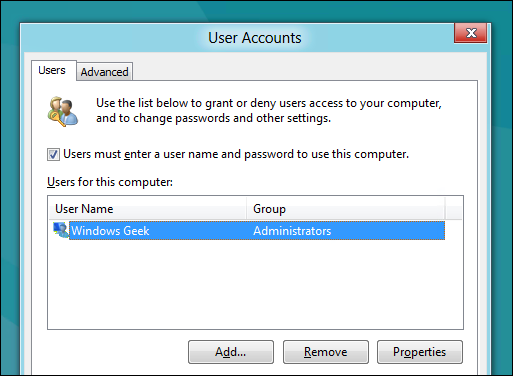 The network access server prompts for credentials (e.g., user name and password). 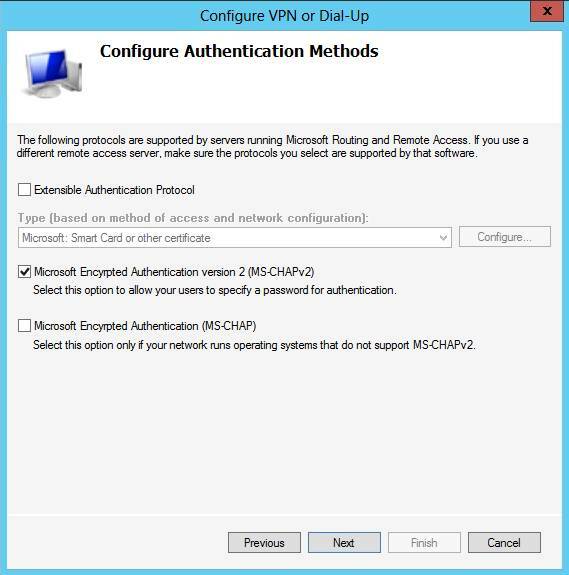 The remote access server sends a request to the RADIUS server for authentication and authorization, which includes the credentials (password is encrypted). The RADIUS server examines the request and responds by rejecting the request (if no or incorrect credentials are provided), challenge the request by asking for more information (PIN, Smart Card, etc. ), or accepting the request by authenticating the user’s/machine’s identity. If the request is accepted, the RADIUS server checks the database to determine which resources the user is allowed to use and authorizes the user to use the requested resources if they are on the list. Begins tracking when the network access server sends an Accounting Start packet. Receives interim update packets from the network server during the active session. Information can include the amount of time and data used. Receives an Accounting Stop packet when the session ends. RADIUS uses UDP packets to communicate, over ports 1645 and 1646. It can use a number of different authentication methods. You can select multiple encryption strengths and the server and clients will negotiate the strongest supported by both. All strengths are allowed by default, as shown in Figure 7. You can unchecked the lower strength encryption choices to force connections only when the more secure encryption can be supported. If you uncheck all of the boxes, the traffic from the clients to the network access server will not be encrypted, so this is not recommended. 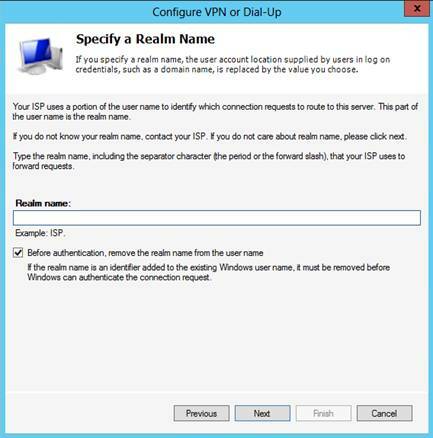 Figure 7 The next page of the wizard asks you to specify a realm name, which is part of the user name that the ISP uses to identify the connection requests that route to this server. It is not required that you specify a realm name; you can leave this field blank if you don’t know the realm name or don’t care about it. If you do specify a realm name, you should leave the box checked that says Before authentication, remove the realm name form the user name, as shown in Figure 8, so Windows will be able to authenticate the connection request. Figure 8 This completes the wizard and when you click Finish on the next page, it will automatically create two policies: a network policy and a connection request policy. The names of these policies will use the name that you assigned earlier in the wizard. The RADIUS clients will also be configured. There is a link labeled Configuration Details by which you can see a summary of the configuration settings (it opens in your default web browser) so you can review it and make sure everything is right before you click the Finish button. After you click Finish, the new policies will show up in the Policies nodes of the NPS management console, under Connect Request Policies and Network Policies, as you can see in Figure 9. Figure 9 Your RADIUS clients that you configured through the wizard will show up in the RADIUS Clients node. 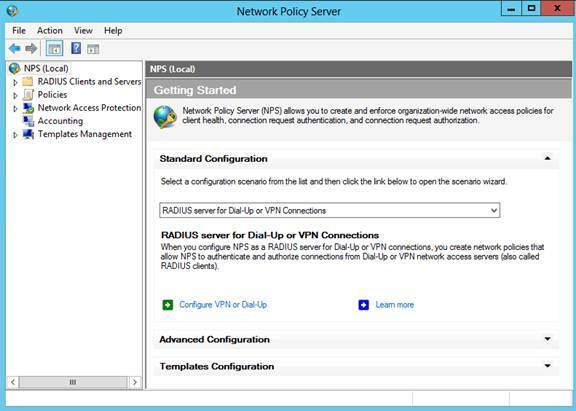 In Part 3 of this multi-part series on Understanding and Configuring NPAS in Windows Server 2012, we began our discussion of RADIUS and how to configure the NPS to act as a RADIUS server. We covered the steps of the configuration wizard this time, and next time we’ll talk about how to use the Advanced Configuration option, how to configure RADIUS server groups and how to configure a RADIUS proxy. You can configure the NAP server with three different types of policies: Connection Request Policies that use connections and settings to authenticate client requests to access the network. These policies also control where the authentication will be performed. You must have a connection request policy for each NAP enforcement method. Network Policies that use conditions, settings and constraints to determine the level of access that will be authorized for a client that attempts to connect to the network. You need at least two network policies to deploy NAP: one for client computers that are found to be compliant with your health policies and one for those clients that are out of compliance. Health Policies that specify which System Health Validators (SHVs) are to be evaluated and how they’re to be used to evaluate health status. You have to enable at least one SHV for each health policy. 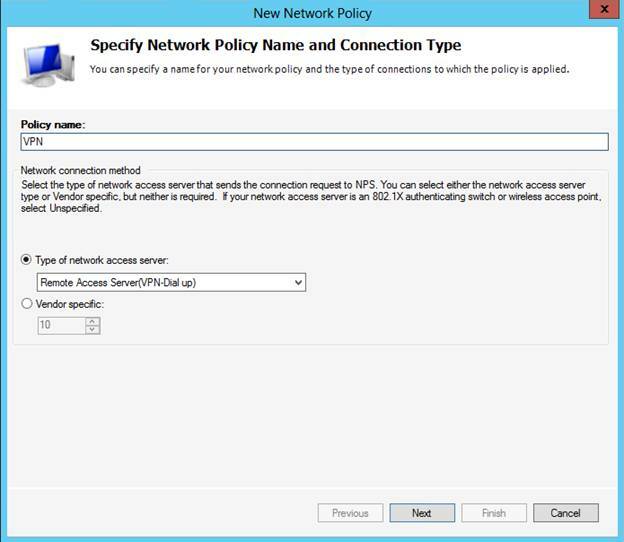 When creating network policies, you need to keep in mind that a client request can match one connection policy and one network policy. It cannot match multiple policies of a type, so when a match is made, none of the other policies will be applied. That means the order of processing policies is important. The source of the request is also used in determining the order for evaluation. If there are policies that specify a source, requests sent from a matching source are only evaluated against these policies. If none of the policies specify a source that matches, clients try to match policies with the Unspecified source. If there are multiple policies with the same source that matches the client source, the policy that’s highest in the processing order is used (and if it fails, the NPS goes down the list of policies in the processing order until it finds a policy that matches). 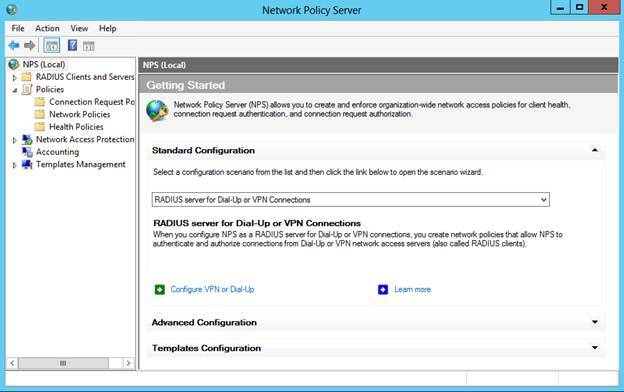 To configure NSP with a network policy, use the New Network Policy wizard on the NPS server. On the NPS server, open the Network Policy Server administrative tool from the Administrative Tools menu. In the left pane, expand the Policies node and click Network Policies. Right click and select New to start the New Network Policy Wizard, as shown in Figure 2. Figure 2: Creating a new network policy You can create a new connection request policy or a new health policy by right clicking the Connection Request Policy or Health Policies node and selecting New. The steps involved in configuring VPN servers with NPS are as follows: Install and configure your VPN servers as discussed in the first part of this chapter. Decide what authentication method is to be used. Install the NPS role on the NPS server. Autoenroll a server certificate to the NPS server(s) or purchase a server certificate (for PEAP-MS-CHAP v2 authentication). For EAP-TLS or PEAP-TLS without smart cards, autoenroll user and/or computer certificates to domain users and client computers that are domain members. Configure your VPN servers as RADIUS clients in NPS. 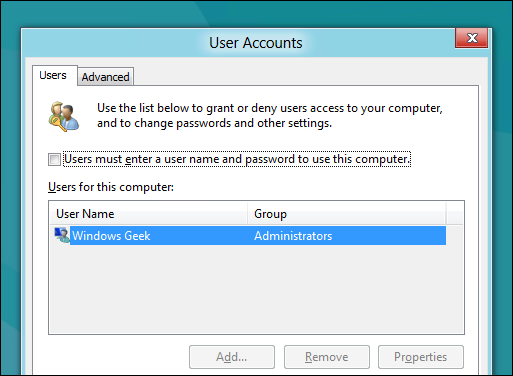 Create an Active Directory user group for users who will be allowed to connect via the VPN servers. 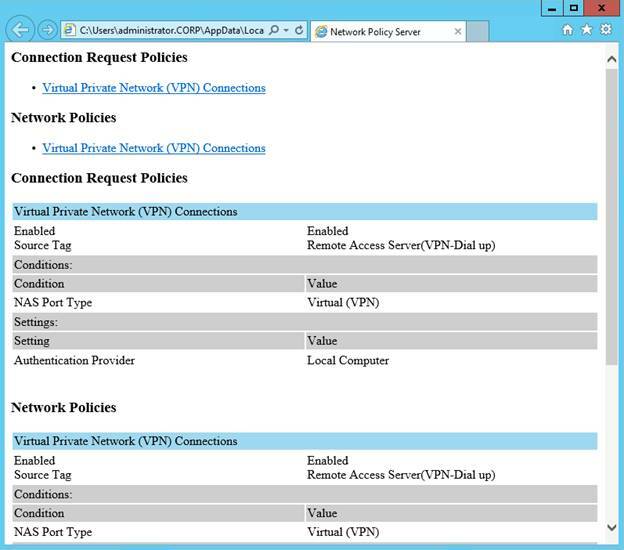 Configure network policies for VPN services in NPS. 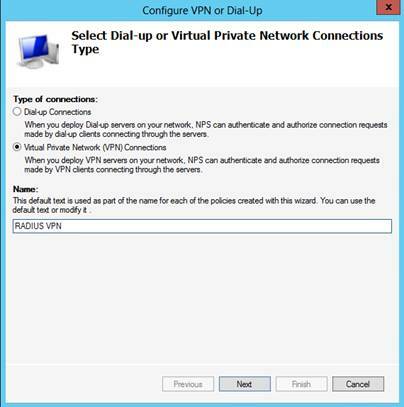 To create the connection request and network policies that you need in order to deploy VPN servers as RADIUS clients to the NPS server, you can use the New Dial-up or Virtual Private Network Connections wizard. Open the NPS console from the Administrative Tools menu on the server where you have installed the Network Policy Server role service. Click the NPS (Local) top level node in the left pane and follow these steps: Under Standard Configuration, in the drop-down box, select RADIUS server for Dial-up or VPN Connections, as shown in Figure 3. Figure 3: Creating the policies required to deploy VPN servers as RADIUS clients to the NPS Click Configure VPN or Dial-Up. 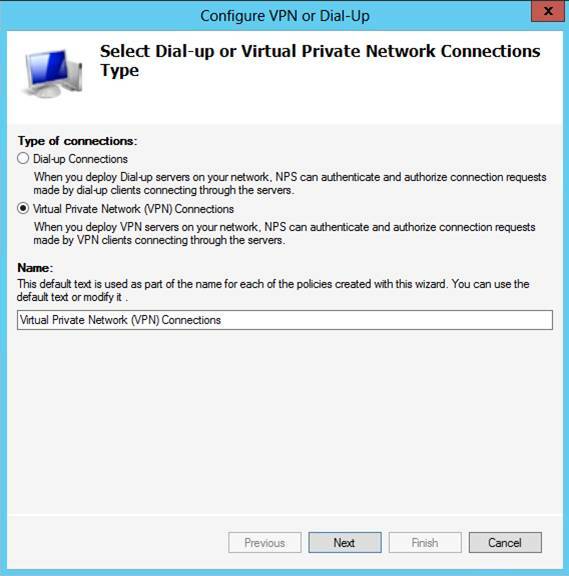 In the wizard, select Virtual Private Network (VPN) Connections under the Type of connections section, as shown in Figure 4. Figure 4:Selecting the connections type (VPN) Provide text to be part of the name for each of the policies the wizard creates or accept the default, and click Next. 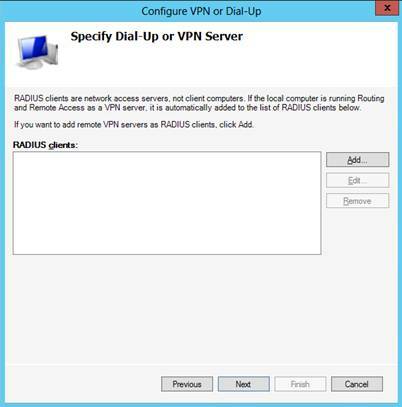 On the Specify Dial-Up or VPN Server page, the local computer will be automatically added as a RADIUS client to the NPS server if it is running RRAS as a VPN server. You can add remote VPN servers by clicking the Add button. On the Configure Authentication Methods page, select the protocol(s) you want to use for authentication, as shown in Figure 5. 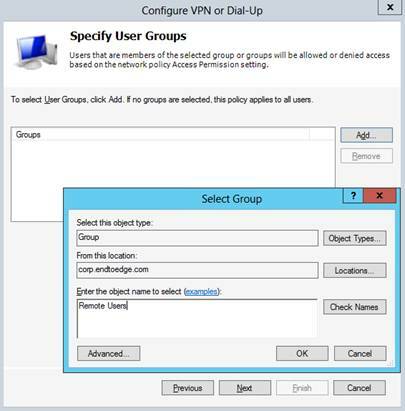 Figure 5: Configuring the authentication method(s) On the Specify User Groups page, you can select the groups to which the policy will apply by clicking the Add button. If you don’t select any groups, the policy will apply to all users. 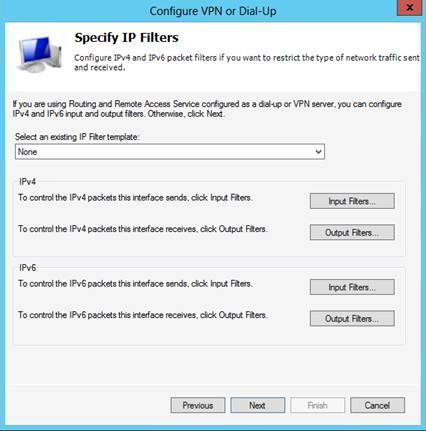 On the Specify IP Filters page, you can configure IPv4 and IPv6 input and output filters for the RRAS VPN server. On the Specify Encryption Settings page, you can select the encryption strength to be used for MPPE (40-bit, 56-bit and/or 128-bit). By default, all three are selected, as shown in Figure 6. Figure 6:Specifying encryption settings On the Specify Realm Name page, you can specify a realm name to replace the domain name in user credentials. This is the name that your ISP uses to forward requests. This is an optional field. On the Completing New Dial-Up or Virtual Private Network Connections and RADIUS clients page (the last page of the wizard), you can click Configuration Details to review your configuration choices. This will open the configuration details in your default web browser, as shown in Figure 7. Figure 7: Viewing configuration details in the browser Click Finish in the wizard to create the policies. They will now show up in the Connection Request Policies and Network Policies nodes in the Network Policy Server console. You can configure the authentication requirements, certification authorities and request policy for the HRA. Authentication requirements: You can either restrict the issuance of health certificates to authenticated domain users or you can allow anonymous users to obtain health certificates. If you allow both, two separate web sites will be created, one for requests by domain users and one for requests by anonymous users. You can enable SSL so that clients communicating with the web sites must use a secure (https://) URL. The IIS server will need an SSL certificate in the local computer certificate store or the current user certificate store, to be used for server authentication. Certification Authority: You must configure the HRA with at least one NAP CA. You can add or delete CAs and change their order from the HRA console’s Certification Authority node. You can use either a standalone CA or an enterprise CA. Request Policy: The request policy settings define how the HRA communicates with clients, specifically the cryptographic policy elements that include asymmetric key algorithms, hash key algorithms, cryptographic service providers and transport policy. You can use the default request policy setting that negotiate a mutually acceptable encryption mechanism, and this is usually the best practice unless you are certain your modified settings will work properly. An important part of a network security strategy is the protection of the network from threats that can be introduced via the client computers that connect to that network. This becomes particularly vital in the case of remote clients, such as laptops that workers take off site and home computers that employees use to access their work during off-work time or even full-time as telecommuters. Windows Server 2012 based networks have many mechanisms aimed at giving administrators more control over who connects to the corporate network and over the computers they use to connect. DirectAccess is one such technology, and I’ve discussed it in previous articles. But not all clients are able to use DirectAccess; those that run legacy operating systems (pre-Windows 7) and those that are not domain members will need to use a different connection method, such as virtual private networking (VPN). Windows Server operating systems provide features that help to protect the network when VPN clients connect, as well. Network Access Protection (NAP) has been around for quite some time. It was introduced with Windows Server 2008 to provide a built-in policy-based technology similar to Cisco’s Network Access Control (NAC). Windows Server 2008 R2 added functionality and features. 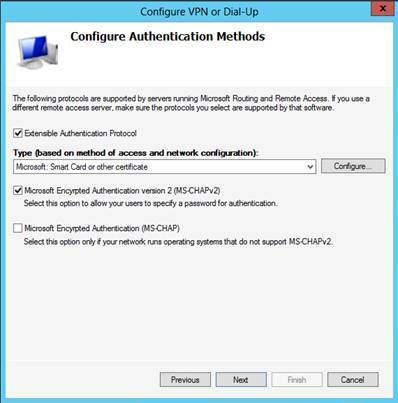 Remote Authentication Dial In User Service (RADIUS) server support in Windows Server has been around even longer. If you’re coming to Windows Server 2012 from Windows Server 2003, when you think of RADIUS in Windows, you probably think of Internet Authentication Service (IAS). In Windows Server 2008, IAS was replaced by NPS – the Network Policy Server. The NPS is part of a larger framework: Microsoft’s Network Policy and Access Services (NPAS). This is the server role through which you deploy Network Access Protection (NAP) in Windows Server 2012, and that’s what we’re going to be talking about in the first part of this series of articles. A new feature in Windows Server 2012 is the ability to use PowerShell to install and configure the Network Policy Server. NAP enforces health policies on a number of connection types, including IPsec-protected communications, IEEE 802.1X-authenticated communications, and terminal services gateway connections. In this article, we’ll be looking at NAP primarily as an enforcement mechanism for remote clients connecting via a VPN. Status of service packs and security updates. NAP is Microsoft’s implementation of a “health” enforcement solution. In the context of protecting remote clients and protecting the network from health “issues” that those remote clients may bring to the network, it checks the identity of each remote client and determines whether it is in compliance with the organization’s health policies. The health information that each client sends to the NAP server is called a statement of health or SoH. The server evaluates this information based on the policies and settings that have been configured. It uses this information, along with group membership, to determine whether and at what level of access the client will be allowed to connect to the corporate network. Clients that are out of compliance with the policies can be brought into compliance through NAP’s mechanisms. NAP does this by performing a network health analysis, verifying the effectiveness of existing security policies, and helping administrators to identify risks by creating a health profile for the network. This improves the overall health of the network by enforcing compliance with your network health policies and restricting the access of remote client computers that are not in compliance. The Network Policy Server is the core component of a NAP deployment. It is used to manage network access through the VPN server, RADIUS servers and other points of access to the network. Depending on your network environment, you may deploy multiple NPS servers. An NPS can be a RADIUS server, a RADIUS proxy or a NAP policy server. The NAP server is where you configure the NAP policies and settings such as health policies, SHVs, and remediation server groups. Remediation servers are the servers to which non-compliant clients are allowed to connect in order to update their configurations so as to become compliant, after which they can be re-evaluated and allowed to connect to other network resources. The NPS works in conjunction with other components, including the System Health Agents (SHAs) and System Health Validators (SHVs). The SHA that is built into Windows Vista and Windows 7 operating systems is called the Windows Security Health Agent (WSHA), which works with the Windows Security Center on the client computer and the Windows Security Health Validator (WSHV). You can configure the WSHV settings to report on the host firewall, virus protection, spyware protection, automatic updating status, and security updates installed. Third party vendors can use the NAP API to create SHAs and SHVs for their software products (for example, third party antivirus programs). The Health Registration Authority (HRA) is another server component of NAP that is used in IPsec enforcement and is installed on a computer that is running NPS and IIS. These services must be installed on the HRA computer. When you install the Network Policy and Access Services server role on a Windows Server 2012 server, the HRA administrative tool will be installed on the NPS server. Likewise, if you install HRA, NPS is automatically installed. The HRA approves the issuance of health certificates to NAP clients. These health certificates are X.509 certificates that are issued by an Active Directory certification authority (CA). A CA that issues health certificates is known as a NAP CA. To get a health certificate from the NAP CA, the client must submit a SoH to the HRA. IIS is used to provide the interface by which the clients contact the HRA to request a health certificate. In Part 2, when we start configuring policies, we’ll go into more detail about what each of these policy types does. NPS also supports templates for health policies, that you can use to make it quicker and easier to configure NPS on the server. These are available in the Templates Management section of the NPS console (which you’ll see in Part 2). You can easily create new templates. Plan the appropriate placement of your NAP server(s) on the network so it can communicate with other NAP components and so it will have a connection to Active Directory Domain Services (AD DS) for authentication of domain users connecting through the VPN. Determine whether you need multiple NAP servers for load balancing and failover. Determine which health requirements you want to enforce (for example, firewall, virus protection, antivirus software updates, spyware protection and updates, automatic updating enabled, security updates installed via WSUS and/or Windows Update). Determine how you will deal with those computers that will be exempt from health checks (e.g., domain controllers and most other servers, devices that are not NAP-capable, and users who must have access at all times. This is your exception management strategy. Consider your NAP reporting strategy. Create a pilot program to help you evaluate your NAP deployment decisions. Document the NAP deployment design. To deploy NAP on Windows Server 2012, you will need to install the Network Policy and Access Services role with the Network Policy Server role service. You can do this in one of two ways: by using Server Manager to install NPS via the graphical user interface, or by using PowerShell to install NPS via the command line. In Part 2 of this article series, we’ll dig down into how to install NPAS using both of these methods, and then we’ll look at the steps that you need to complete in order to your VPN servers to work with the Network Policy Server (NPS) so they can use NAP to validate the health of VPN clients that attempt to connect to your corporate network. For downloadiong the application you can visit below link. For the Printer Migration Server 2012 Print Management tool supports an export feature, this will export the printers, print queues, printer drivers to a print migration file. just go to print management > right click your print server > choose export. then take the file to you new print server and do an import. you can access the print migration directly as well see the link below: https://technet.microsoft.com/en-us/library/cc773832(v=ws.10).aspx another option is to use the windows server migration tools: https://technet.microsoft.com/en-us/library/dd379545(v=ws.10).aspx here is a print migration guide: https://technet.microsoft.com/en-us/library/dd379488(v=ws.10).aspx as for redirecting the users existing printers, are the computers domain joined? if so then I would use Group Policy Preferences to map new printers to their computers, set the default printer and remove the old ones. 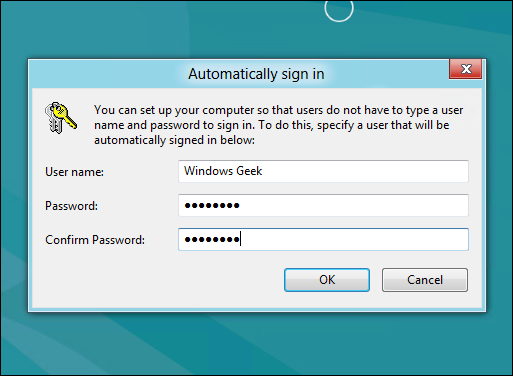 Using SCCM 2012 R2 to Deploy Windows 7 copied from the source Here Deploying Windows 7 Using SCCM 2012 R2 n this post we will see the steps for deploying windows 7 using SCCM 2012 R2. In my previous post we saw the steps to capture a reference operating system (Windows 7) using SCCM 2012 R2. Note that this post is different from the one which shows the steps to build and capture the operating systems using SCCM 2012, we will not be using build and capture approach here rather we will capture a reference operating system, i.e. 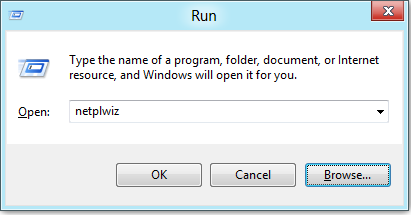 capture windows 7 using SCCM 2012 R2 and we will deploy the same using SCCM 2012 R2 in the this post. We will be creating a device collection first and then we will import the computer information to this device collection. One the computer is added to the collection we will create task sequence, configure it and deploy it the device collection. [drive:][path][filename] Specifies drive, directory, or files to list. /C Display the thousand separator in file sizes. This is the default. Use /-C to disable display of separator. /R Display alternate data streams of the file. /X This displays the short names generated for non-8dot3 file names. The format is that of /N with the short name inserted before the long name. If no short name is present, blanks are displayed in its place. Switches may be preset in the DIRCMD environment variable. Override preset switches by prefixing any switch with – (hyphen)–for example, /-W. Lists all files and directories in the current directory. By default the dir command lists the files and directories in alphabetic order. The above command lists any file that ends with the .exe file extension. See the wildcarddefinition for further wildcard examples. The above is using multiple filespecs to list any files ending with .txt and .doc in one command. List only the directories in the current directory. If you need to move into one of the directories listed use the cd command. If the directory has lots of files and you cannot read all the files as they scroll by, you can use this command and it displays all files one page at a time. If you don’t need file information you can use this command to list only the files and directories going horizontally, taking as little as space needed.